Many moons ago, just before Easter, I was born. It was one of the few times in my life that I was exceptionally early (6 weeks to be exact). I came home from the hospital just before Easter Sunday. Since then Easter and my birthday have shared a close proximity and I’ve often ended up with Easter-themed cakes and treats. Somewhere my mother has a photo of the time I climbed on the dining room table (at the age of 2) and helped myself to a bunny shaped cake. It wasn’t pretty—by the time I was discovered the cake was a pile of coconut and crumbs. 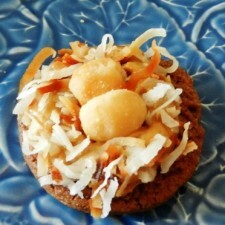 I created this recipe for Easter this year, but you could easily enjoy these little cookie nests year round. They’re delicious! Cream coconut oil and sugar, add the egg and mix together. 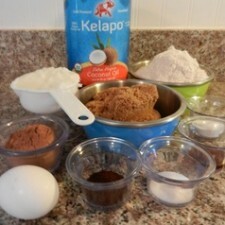 In a separate bowl, combine dry ingredients and whisk together. Gradually add dry ingredients to creamed mixture then blend well. Stir vanilla into dough. Preheat oven to 400°F. Dough can be shaped with a small scoop and flattened or formed into a log and sliced. Bake 8 minutes until done but no significant color change, for best results do not use a dark pan. 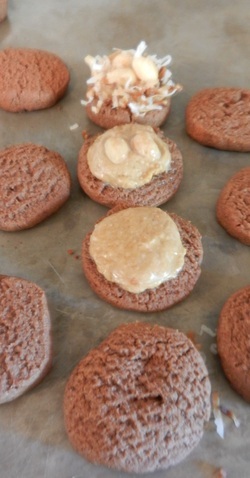 Allow cookies to rest on the pan for a few minutes after removing from oven before transferring to a cooling rack. 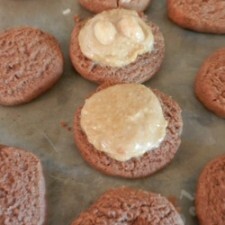 Do not allow them to cool completely on cookie sheet or they will stick. Pour coconut oil in a mixing bowl. Dissolve coffee in vanilla and add to coconut oil. Gradually beat in the powdered sugar, ¼ cup at a time. Beat until smooth and fluffy. Pipe a circle of frosting in the center of each cookie. 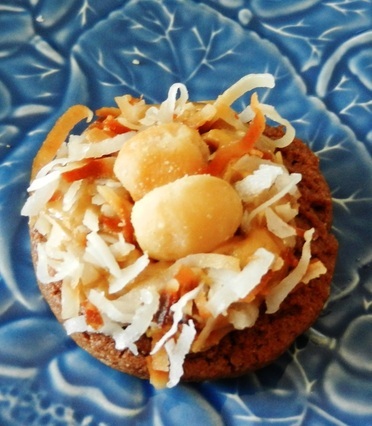 Place a few macadamia “eggs” in the center of each cookie and surround with a little of the cooled toasted coconut to create beautiful, delicious, nests. These aren’t vegan, since they contain egg, but you could easily substitute for the eggs if you prefer a vegan diet.